Bilateral and multilateral military exercises with friendly nations introduce new concepts, enhance understanding of other’s capabilities, and help the forces to experience how the friendly nations’ forces operate. They also help in interoperability, besides fostering camaraderie and understanding amongst themselves. According to Col Sandeep Thapar (retd), exercises are aimed at developing relations, for advancing military diplomacy, and mainly for sending a message to an adversary that one has good relations with other nations. Since most countries are in some form or the other affected by internal terrorism, counter-terrorism operations have been one of focus areas for exercises. “Basically, a neutral subject is chosen, such as disaster management, counter-terror, weaponry familiarisation, sharing of tactics, etc.,” he says. Former Master General Ordnance, Lt Gen. Rajinder Singh says that in bilateral exercises, the focus is mainly on counter-terror drills because exercises aimed at countering adversaries or conventional warfare are only conducted amongst own forces. 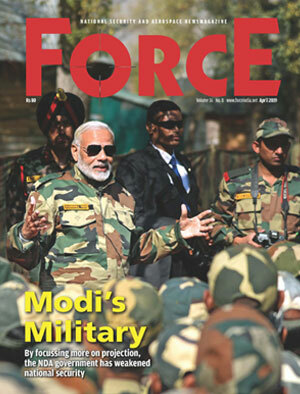 “The Indian Army is deeply committed in counter-terrorism, so it makes sense that we imbibe best practices from others through military exercises,” he says. The Indian Army conducted a series of bilateral exercises this year, each having its own significance, size and complexity. Here’s a brief low-down of the major exercises held in 2018. Indian and Chinese troops engaged in 7th edition of the Exercise Hand-in-Hand in the Chinese city of Chengdu, from 10 to 23 December 2018, as part of efforts by the armies of two countries to improve relations after the Doklam stand-off. About 100 personnel from both sides took part in the exercise which focused on tactical level operations in a counter-terror environment. The exercise was suspended in 2017 following the Doklam incident. India claimed the aim of the exercise was to build closer relations between the militaries of both countries. The exercises involved tactical level operations in an International counter insurgency/counter terrorist environment as per UN mandate. The exercise focused on adaptive training, basic training, live-fire shooting and comprehensive drills. 11 Sikh Light Infantry of Indian Army was involved from the Indian side while China was represented by a unit from the Tibetan military district.